North Korea claims to have tested a two-stage thermonuclear device ready for use in an ICBM. 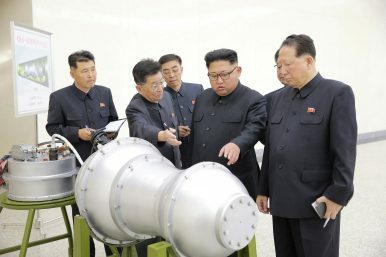 The claim and test followed a release in North Korean state media of images showing Kim Jong-un inspecting a never-before-seen compact nuclear device that resembled a two-stage Teller-Ulam design thermonuclear bomb, with two slight protrusions suggesting a primary fission stage and secondary fusion stage. The design of the device was markedly different from a design that North Korea first revealed in February 2016. North Korea claimed that its fourth and fifth nuclear tests in 2016 also involved a thermonuclear device — or hydrogen bomb — but most experts doubted that it had tested a fully staged device. Instead, North Korea’s 2016 devices were widely thought to be a boosted fission device. Independent analysis of North Korea’s nuclear weapons program has noted the production of materials, including Lithium-6, which could be used in a thermonuclear bomb. North Korea’s claim would suggest that it tested the specific device seen in the images released on September 3. Verification of the kind of device North Korea tested — specifically, whether it was a fully staged thermonuclear bomb — would require the collection of radionuclides released by the detonation into the atmosphere. That would require the underground nuclear test to have “vented”; North Korea has been remarkably successful at restricting venting for its tests to date. Eight minutes after the detonation on Sunday, however, both USGS and CEA reported a secondary seismic event that was reported to be a cavity collapse at the test site. USGS reported a magnitude of a 4.1 for that event while CEA ran an earlier report that was then retracted suggesting a 4.6 magnitude event. A collapse at the site following what may have been a considerably larger bomb may not have been unexpected, but, depending on the geology of the site, the incident could have allowed for unintended venting at the test site. (A collapse may be verifiable by independent analysts via satellite imagery.) Given North Korea’s success with venting prevention during previous tests, however, even a partial collapse may not allow for sufficient atmospheric release of the kinds of signatures that would be necessary to verify Pyongyang’s claims about its weapon design. In the coming days, nuclear weapons experts will be poring over data to assess the sort of yield North Korea may have demonstrated. Early analyses from multiple experts and the South Korean government suggest that North Korea has comfortably demonstrated an explosive yield in the range of at least 100 kilotons with this test. That would be a considerable improvement from the 30 kiloton yield estimated in its fifth test and ideal for targeting U.S. cities—a primary objective in North Korea’s pursuit of an ICBM. Sunday’s test comes after North Korea carried out its most provocative ballistic missile test to date; it flew a Hwasong-12 intermediate-range ballistic missile (IRBM) over Japanese territory into the northern Pacific Ocean, in a first, last week. The launch led to a massive show of force by the United States, South Korea, and Japan, with fighters and bombers deployed in the region. It’s unclear how these states or the international community at large will respond to North Korea’s latest test. The United Nations Security Council recently adopted a new round of sanctions against the country with Resolution 2371, but North Korea markedly underlined that its new two-stage nuclear weapon was an entirely indigenous design — hinting that sanctions alone will be insufficient in halting its nuclear ambitions. China Earthquake Administration detected an explosion equal to a 6.3-magnitude earthquake.